MSK Prasad-led selection committee, on Monday, announced India’s 15-member squad for the upcoming World Cup and it was a heartbreak for Ambati Rayudu. The BCCI has named 15-member squad for ICC Cricket World Cup 2019. Vijay Shankar and Dinesh Karthik have been included in the squad. Ambati Rayudu and Rishabh Pant have been left out. 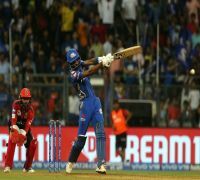 MSK Prasad-led selection committee, on Monday, announced India’s 15-member squad for the upcoming World Cup and it was a heartbreak for Ambati Rayudu. The Hyderabad batsman was the team’s number four since Asia Cup last year and there were no doubts about his selection. But as time passed on, runs and form deserted Rayudu and that eventually turned out to be the reason for his exclusion. Vijay Shankar played well since the Australia and New Zealand tour and he grabbed the much-debated number four slot for the World Cup. However, everyone was waiting for Ambati Rayudu to comment on his World Cup snub and the man has come up with a sarcastic message on Twitter. He indirectly took a dig mentioning about ordering the 3D glasses to watch the mega-event from home. “Just Ordered a new set of 3d glasses to watch the world cup,” Rayudu’s tweet read. “We did give a few more chances to Rayudu but Vijay Shankar gives three dimensions. He can bat if the conditions are overcast, he can bowl, plus he is a fielder. We are looking at Vijay Shankar as a No. 4,” chief selector MSK Prasad had said, justifying his decision.